After I posted this yesterday I was unsatisfied with the ending. So I tried to fix it a little. I feel much better now! I didn't know how early to get to the Scera Shell outdoor theater, but when Anson and I arrived I figured we were on the late side. White plastic chairs covered the western side of the grassy ampitheater and a patchwork of blankets smothered the eastern half. Still, we stood in line with our tickets, Anson picking out all the letters he knew on the sponsor posters lining the opening gate. At five years old this would be my son's first theater experience. When I asked him if he wanted to go to a play with me he asked, "What's a play?" This was a defeat of sorts. My husband, has acted professionally for more than fifteen years. His resume boasts film, TV, industrial, commercials and (my favorite) the theater. However, I realized in this short invitation to my son we hadn't educated him at all on "what daddy does" or even the thrills of a stage coming to life. Granted, we are not the musical theater type family and this scales back the exposure we would give to our young children, but still I asked myself, why hadn't we taken time to create plays in the backyard? I think when you are a professional of any sort, there is a sad pretentiousness about the less-professional performances in your field. Because I grew up with a brother who acted and directed and then married a producer/actor I haven't had much exposure to community theater. In fact, last night was the second time in my entire life I had been to a play at the Scera--a realization that came to me when it was announced that Tarzan (the play of the evening) was the theater's one-hundred-and-thirty-fifth play in twenty years. I only live ten minutes away. We found a spot on the top of the hill, a pretty good view obstructed slightly by some speakers. Anson repeatedly asked if "this is the play?" as we sat and watched the empty stage covered in vines and rocks. When it did start, Anson couldn't believe his eyes. He talked and talked and asked every question under the dusty sky, which made me also realize I hadn't taught him "theater voice." "Why are those people dressed up like butterflies?" "Why is that girl dressed up like a gorilla?" "Is that a real baby, like for reals?" We watched dancers of ranging skills move and kick and twirl and focus on light choreography. We heard singing that sometimes strayed from its intended key, but boasted a meaningful deliverance. We saw lights that sparkled and shook the stage. And we clapped and laughed along with our neighbors sitting on quilts brushing off the gnats and hand-diving for popcorn. For me it was refreshing to see all different body types cast in the chorus. In fact, my desire for the uniformity and professionalism in high-scale theater melted away entirely. I looked forward to the big cast numbers where I could watch lots of different bodies types dance to the same song. I liked looking at costumes produced by an imagination and a tight budget. The whole production -from the actors to the audience participation- was approachable and pro-community and it made me wonder, where have I been? By the second act Anson was sold. We cuddled up in the cool June air and watch the play spark and die. 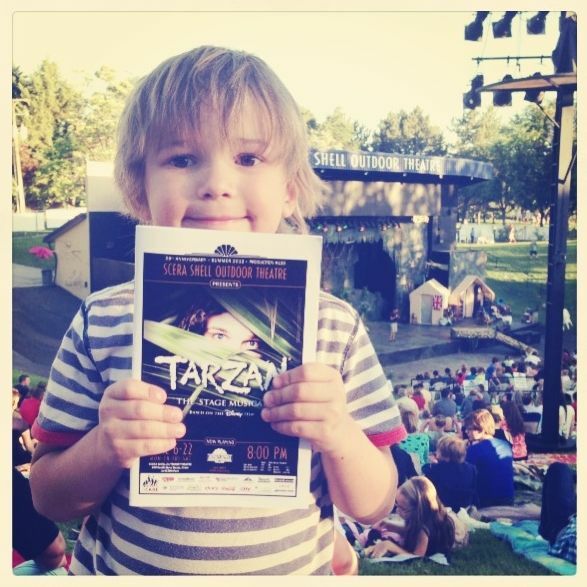 Before the last line was delivered and Tarzan had swung on the vine across the stage for the last time, Anson turned to me and said, "I love spending time with you Mommy," and he gave me the most passionate kiss right on my lips. And when we walked back to our car with the quilt in my one hand and Anson's hand in the other, he looked up in the sky and saw his first shooting star. That's the thrill of the theater, how it turns life into something spectacular. Welcome to the magic my boy! Do you want to go? Tarzan runs until the 22nd. See here for details.